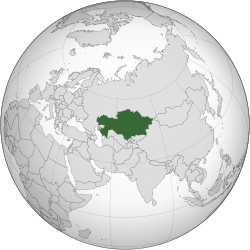 ↑ ᱒.᱐ ᱒.᱑ ᱒.᱒ ᱒.᱓ "Kazakhstan". International Monetary Fund. Retrieved 2012-04-18. ↑ "Human Development Report 2011" (PDF). United Nations. 2011. Retrieved 15 ᱱᱚᱵᱷᱮᱢᱵᱚᱨ 2011.